Home BONG REVILLA JODI STA. 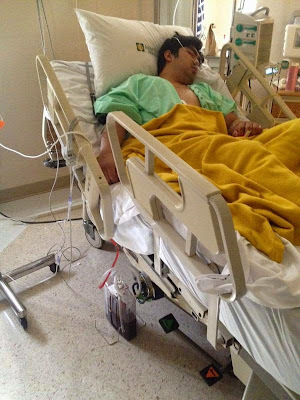 MARIA JOLO REVILLA LANI MERCADO POLITICS Jolo Revilla Hospital Bed Photos: Look! Cavite Vice Gov. 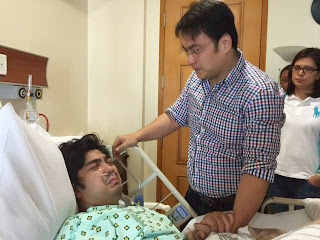 Jolo Revilla, boyfriend of actress Jodi Sta Maria, is in stable condition, but still has bleeding lungs, following that Saturday incident when he "accidentally" shot his own chest. 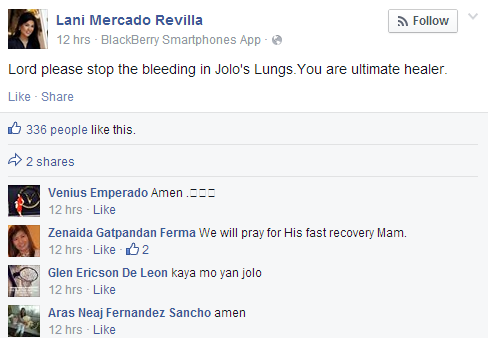 In her recent Facebook post, Jolo's mom Congresswoman Lani Mercado-Revilla is praying to God to heal Jolo 's lungs which still keeps on bleeding more than 2 days already after the incident. Lani Mercado Revilla: "Lord please stop the bleeding in Jolo's Lungs.You are ultimate healer." As shown in the picture of Jolo at he hospital, which was posted by news anchor Karen Davila on Twitter, Jolo is still under intensive care, and has a tube to drain blood from his lungs. The unfortunate incident happened last Saturday morning, 9AM, at their residence in Ayala Alabang. As shared by Cong. Lani, Jolo was cleaning his .40 Glock handgun when he accidentally fired it. He suffered a gunshot wound on his right chest and was rushed to the Asian Hospital in Muntinlupa City. Due to the "self-inflicted" nature of the wound, many initially believed Jolo attempted to commit suicide, but the family's legal counsel Atty. Raymond Fortun has denied it, and insisted it was nothing but an accident. Despite Jolo going through danger or critical condition, their detractors are still not ruling out the idea that this is just a "stunt", a "paawa" effect to gain sympathy for Sen. Bong Revilla, who's currently in jail for his alleged involvement in the Pork Barrel Scam. 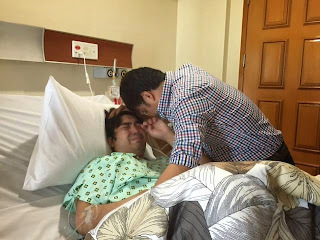 Probably to dispel any doubts, the family released that above picture of Jolo plus another one (both with an unbuttoned hospital gown, to show he really has a wounded chest) while lying on the hospital bed. In a newsflash on GMA 7 this morning, it was reported that the Sandiganbayan has granted the Senator's motion to visit his son at the hospital. Check out photos of their heartbreaking father-and-son moment at the hospital (credit to Atty. Raymund Fortun via ABS-CBN News). everywhere? are you sure? this is a general information. you can have those even just by watching on TV. you kinda offended me. I am working hard to blog, but you're telling me that.